Inventory Turns – moving at the speed of “G”’s or ZZZZ’s? NASCAR is an important sport here in the Richmond, Virginia area. And so, it’s not surprising that I was drawn to a series of studies related to the science of speed, (produced for the National Science Foundation (NSF), written and hosted by Diandra Leslie-Pelecky). These studies explain the scientific principles that are so essential to the NASCAR experience. If you manage inventory, then you know that the Turn/Earn index is focused on profits. Like winning at NASCAR, speed is of the essence. Leslie-Pelecky goes on to describe “Momentum and Time”, “Grip”, “Power” and “Drag and Drafting” in her study, terms that might be used by business folks to describe the financial challenges in managing inventory. “Engine power is constrained at superspeedways like Daytona and Talladega, so teams use aerodynamics to gain an advantage. Teams adjust their cars to minimize drag, but then it’s up to the drivers to find ‘the draft’ and to trust the drivers behind them to literally ‘bump’ them into Victory Lane”, according to Diandra. So, we all know that our inventory turns and earns, “engine power”, is constrained by the “drag” our software places on them. ACUMEN Corporation offers ERP software which includes sophisticated and user-friendly accounting and inventory systems, which we believe offers “the draft” needed to maximize those turns and earns. We manage IT teams who can use aerodynamics (better software design) to minimize drag, and who will drive to bump you into victory lane. Then add the number 1 business software design organization in the world (SAP America) to the experienced, dedicated drivers (Team ACUMEN) to take you to the next win and get that inventory in, out, and delivered so that your customers come back, and your bottom line gets revved. Assurance of appropriate stocking and “available to promise” capability is a daily reality for wholesalers and manufacturers all over the country. If you can only squeeze a 20% margin from your typical inventory item or line of products it stands to reason that you’ll need quick turns to realize your profit goals. Momentum and time can help you maintain outstanding service levels and solid customer satisfaction. And, of course, you want to do all that and remain profitable. In most businesses our customers have alternatives and are constantly monitoring key indicators in inventory performance and “aerodynamics”. The right software, the right implementation experience, and the right dedicated drivers are wrapped up in an organization by the name of ACUMEN Corporation. I highly recommend you give them a look, (but then I would, wouldn’t I). 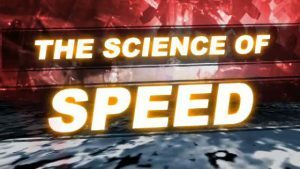 Viewers learn how science makes cars powerful, agile, fast and safe–and how these same principles affect their own cars. You can’t win NASCAR races without getting the science right. NASCAR teams push science to its limits to eke out the tenths or hundredths of a second that separate the winner from the also-rans. This video series uses the elements of NASCAR to show that a racecar really is a science experiment on wheels. Engine power is constrained at superspeedways like Daytona and Talladega, so teams use aerodynamics to gain an advantage. Teams adjust their cars to minimize drag, but then it’s up to the drivers to find ‘the draft’ and to trust the drivers behind them to literally “bump” them into Victory Lane. Conservation of energy explains how NASCAR’s new car helped driver Michael McDowell walk away from a scary crash at Texas Motor Speedway in 2008. There’s one thing every driver always want more of: Grip. Grip is the frictional force that holds the tires on the track, but crew chiefs like Steve Letarte describe it as a ‘warm and fuzzy feeling’ when you have it. Whether mechanical or aerodynamic, more is always better. “Loud is fast” Brian Vickers tells us, and speed is one reason racecars don’t have mufflers. Experiencing a NASCAR race means feeling the roar of the engines as well as hearing them. It’s all good–as long as you’ve got your ear protection. NASCAR tires don’t have “air pressure” because they’re filled with nitrogen. The culprit responsible for increasing tire pressure during a race is friction. Using dry nitrogen gas helps the team predict how hot the tire will get and how much the pressure will “build” during a race. Anyone can go fast straight: The challenge is turning. It takes more than ten thousand pounds of force to get a racecar around Turn 3 at Texas Motor Speedway at 180 mph. All that force comes from four tiny patches of rubber–the only thing keeping the car on the track and out of the wall. 850 horses all lined up–that’s how much power a NASCAR Sprint Cup engine has. The engine’s job is to convert the energy in fuel to speed. NASCAR engines do it faster and more efficiently than passenger car engines. A racecar driver is like Goldilocks: The car always seems to be too loose or too tight. Getting the right balance is hard because the weight of the fuel changes and the tires wear during each green-flag run. Understanding the science is how crew chiefs make the car “just right”. Increasing the time of a collision from a tenth of a second to two tenths of a second can make a huge difference in the number of G’s a driver experiences. The car, the track, seat belts, and seat construction spread out the force of impact and save lives. NASCAR corners are divided into three parts because the car’s grip changes in different parts of a turn. The higher center of gravity in the new car challenges crew chiefs to minimize weight shift around a turn. Equipment like the seven-post rig helps, but the ultimate test is on the track. “Frightening” is how Jeff Gordon describes fire, even though he knows he’s protected head to toe (and right down to his underwear) by fire-resistant Nomex fabric. Firesuits and the associated gear don’t just protect drivers from fire, though–they decrease the rate of heat transfer, giving the driver a little more time to move somewhere cooler.